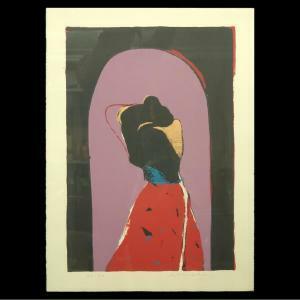 Find artworks, auction results, sale prices and pictures of Fritz William Scholder at auctions worldwide. 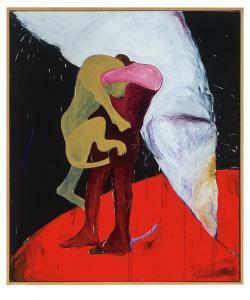 Fritz Scholder, American (1937-2005) Color Lithograph "First Dream". Signed, numbered 82/90 in pencil. Three chops in lower margin: Tamarind lower left, Printer's lower right, artist's lower center. Print documentation included. Sheet measures 30" x 22", frame measures 37" x 29-1/2". Condition: Good condition. Scholder, Fritz William (American, 1937-2005). "Mirror Image #4" [Self-Portrait]. October 27, 1968. Felt ink pen on paper. 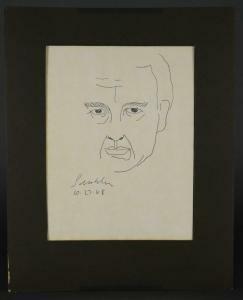 Signed and dated in ink, l.l. Titled and dated in ink, verso. Image: 10 3/8" x 7 3/4" Matted: 15 1/8" x 12" Condition: Good condition. Laid down to matting. Provenance: Acquired from the artist. Fritz Scholder Limited edition Lithograph Limited edition 15/100 original lithograph "Indian with flag" signed and numbered in pencil bottom, blind stamp bottom left, purchased at Scholder's show in March 1974 from the Elaine Horwittch Gallery, and includes original receipt and show flyer. 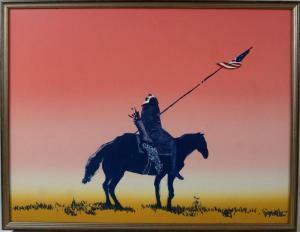 Measures approx 30" x 38" frame measures 32" x 42"
ORIGINAL SIGNED FRITZ SCHOLDER SELF PORTRAIT, CIRCA 1975 & MORE. 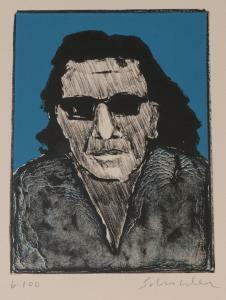 Comprising an original lithograph in colors on Arches buff paper titled \“Self Portrait with Dark Glasses\”, signed in pencil on margin lower right and numbered lower left 6/100, image size 8.1 inches x 6 inches, sheet is loose and measures 11 inches x 9 inches. Together with two books and folio including an artist signed hard cover copy of SCHOLDER/INDIANS, Northland Press, Arizona, 1972 with original dust jacket and dedication page with artist signed inscription to gallery owner Joe Cosgrove dated 10-3-74, and a hard cover copy of the book Fritz Scholder Lithographs, New York Graphics Society, 1975. As well as a folio of TEN INDIANS, a suite of ten reproduction etching and aquatints, El Dorado Press, Berkeley California, 1975, each sheet measuring 9.25 inches x 6.25 inches.